An NYPD homicide cop John Corey who was wounded in the line of duty is convalescing in a rural part of Long Island. A young couple he knows are shot and killed on the family patio. They had previously worked as biologists at Plum Island, a research site which was said to be an incubator for germ warfare. This double murder has terrifying global implications – and forces Corey and two incredible women into a perilous search for the secrets of Plum Island. DeMille himself, has had a very interesting life spending three years as an officer in the First Cavalry Division of the United States Army. Between 1966 and 1969 he saw action as an infantry platoon leader during the Vietnam War eventually being decorated with the Bronze Star, the Air Medal and the Vietnamese Cross of Gallantry. 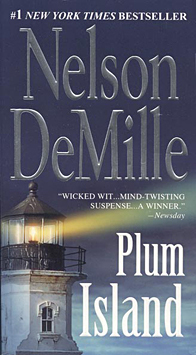 Plum Island by Nelson DeMille is gritty and atmospheric and I would thoroughly recommend it.